And I have two questions: How many people are currently working on P:C? Because the forum seems pretty empty. And what are your goals right now? thankyou for dropping by and notifying us on your work at TR. Some help and interest in our project is definitely needed and appreciated. Currently we are roughly 5 people that work on the mod in a regular frequency. It's not much, but we are rather close to a fully npced release of Stirk with a lot of nice new stuff in it. We also have a rather large chunk of the gold coast that is being interiorized these days. Great! Thank you for the quick response. Well, 5 people are not many, I hope I can help out at some places. I already have seen that you have really strong artists here (I have seen Saint Jiubs stain glass windows for example - they are simply amazing. If P:C has such asset developers, there is one problem less). I think I will come up with the first sketches of my work soon. Philosophy and Religion in Cyrodiil gives a basic overview of the what and the how of Imperial cults. This is, I think, the most elegant way of fitting together the somewhat unhinged information we have on the subject. The Song of the Abyss is an attempt at making an Imperial creation myth, and can be regarded as scripture of a sort. It's still very much a work in progress, but I think it goes a long way in fleshing out the feel we want to give to Nine Divines-worship. Lastly, this is a much older write-up for the Imperial Cult's structure and activities. I've changed my mind on a lot of this stuff, but it does give some insight in the way we want to go here. We need to keep in mind that the cult as it was depicted in Morrowind is a missionary cult, while the one in Cyrodiil is not. The Imperial priests don't need to bother about fliers, almoners and public works because everyone in Cyrodiil is already a believer. This ties into the cult being perceived as too hermetic and isolated from common problems, and the resultant popularity of totemic and Daedric cults. One important aspect I've tried to emphasize is that the DIvines are impersonal, distant deities. This means that their involvement with the world is small and difficult. Major visions, miracles and revelations should be very rare and noteworthy, and mostly handled through saints and intermediary spirits. Cyrodiil is home to thousands of cults and saints, only a handful of which are associated with the Imperial Cult. Your idea of a charismatic, visionary leader who ultimately is led astray could work very well with this, but perhaps not as the focus of an Imperial Cult questline. This questline would preferably be closer to Tribunal Temple style pilgrimages and challenges, coming in deeper contact with the Divine. I would rather have the player themselves experience a vision than have them do quests for an NPC who's getting the visions. I've noticed that your design is rather heavily based on traditional Christian ideas of religiosity and morality: the wretched sinner who receives his vision, Julianos as a Christ-like redeemer, the Communion discussion etc. The Divines, as a rule, don't really care much about sin, redemption and the traditional Christian memes (this preoccupation, as an aside, is pretty much unique to Christianity:religions like Judaism, Islam, Hinduism, Buddhism etc. tend to stress other things like adherence to moral or immanent law, submission before god, or detachment from worldly realities, in which sin is only part of a larger picture). In the case of the Divines, Dibella can be seen as actually advocating debauchery. In general, we try to steer clear of themes like this under the principle of "weirdness for weirdness' sake": too many fantasy religions are basically just lazy reskins of existing mythologies. Ideally, the Imperial Cult should be just as strange and otherworldly as the Tribunal Temple. Hi infragris! I had a (short) look over your work as well, and its truely inspired. Not bad! What is concerning the imperial cult in cyrodiil, its a little difficult. Id like to point out my latest post of my showcase at this place (this one -- Tue Nov 24, 2015 12:26 pm ). And yes, there is not really a concept like "sin" in the IC. Well, maybe to break the law could be seen as sinning against the empire and thus against the gods, but its still a different thing. I dont see Julianos as a christ-like redeemer, he was only the one who called Marcus Antellius to go to morrowind and setted him free from his skooma-addiction. There are a few mistakes in the Antellius-story which I did not know when I wrote the story. I see the connection of divine powers with the mortal plane as difficult and "stressing" for an (aedric) deity, but there are ways for an aedra to communicate and to show its power. It would be too extensive to explain that right now, but the book "Overview of Gods and Worship" deals with that matter. Its important as well to mention the rank names "oracle", "invoker" and - maybe the most important - "theurgist", about which there is something coming up in my showcase soon. EDIT: I will try to read the three documents that you were posting, but I dont primarily have the purpose to make IC quests here, but more the quests, literature and ideas which simply cannot happen in morrowind. The university is divided into two parts: the school and the research institute. Only guild members of a certain rank, who had proven their loyalty and skill can expect to be accepted as students in the arcane university. There is an entrance examination that must be passed. The player has to do quests in form of examinations or other things which have as rewards free training lessons in a certain school of magic. The player can decide which course (= school of magic, alteration, mysticism...) he/she wants to do and begin. Secondly the player can do courses in vampyrology (origin, clans, methods to kill them), werecreatures, ethnology (origin of men and mer - ehlnofey, different tribes and peoples of men and mer and their change of appereance and culture over the ages, different cultures of todays argonians/khajiit/orc tribes... that live separated from the empire), history, philosophy, religious studies... At the end of each course the player has to do an exam that tests his knowledge. So at the end the very player - and not the PC - has the knowledge and solves the quest through learning things out of books or dialogues. By solving quests / passing courses the player gathers "study-scores". When he has enough of those scores he receives a certificate that says the PC has passed the studies in the arcane university. At very high scores the PC gets the chance to do additional courses to get special titles, similar to a doctors degree. The research institute of the arcane university is the empires main research institute, the player helps the scientists doing their job. There is one institute for each big area of research and there is a team of scientists with a leader (questgiver) in each of the institutes. The arcane university has a big library as well. It also has a "secret area" with books with questionable content, hidden away from the eyes of the students who can not yet handle such a baggage the knowledge those books contain comes with or can not stand certain temptations. A mercenary (lets call him Damian, Redguard in unconventionally combination of heavy armor) tried to make a trade with clavicus. He wanted a strongly improved block skill so that nobody could ever hope to hurt him. Clavicus agreed, but in exchange for that favor clavicus wants the mercenary to break into the house of a noble and steal an amulet, originally forged in coldharbour and worn by a powerful daedra who guarded a certain area of Molag Bals soul prison. Now the mercenary sends the player to steal the amulet for him, because he is not a thief and hasnt the skill to do a theft of this level. As the player steals the amulet, he hears the voice of Clavicus Vile who tells him that the player, not the mercenary had earned the reward and sends him to a shrine where the amulet shall be offered. 1. Give the amulet to the mercenary and tell him what happened. The mercenary will ask the player to talk to Clavicus at his shrine and to ask him to train the mercenary. Clavicus will reluctantly accept that but scold the player for not taking such an opportunity. The mercenary rewards the player with 200 drakes and an enchanted shield. 2. Do what Clavicus said. The player receives the training as a constant ability increase (block + 3). Now he has the option to tell the mercenary what happened or lie to him and say the amulet wasnt where he said. A family gets haunted by mysterious dreams, that become more bizarre and disturbing every night. The mother asks the player to investigate those, because both the imperial cult and the temple failed at solving this problem. The first stage of the quests is to interrogate the family members about the dreams. The dreams dont seem to seek something special, they only try to terrorize the family members. Because a friend of the family who slept a night in the house also had those dreams, the player (journal) gets the idea to sleep in one of the houses beds himself. The player has to visit a person in another town and give a scroll to that person, with an obscure, seemingly fragmentary and senseless text. After the player wakes up, the PC knows the text Vaermina gave to him by heart and gives it to a writer who writes the text on a scroll. The player visits the person from his dream and talks to him. The person tells him, he had a mysterious dream in which a stranger gives a scroll to him which only he can read. After receiving the scroll the persons reaction is disbelieving and he refuses to talk about it. The person disappears from his house (or at what place he stands) and appears at a Vaermina shrine somewhere else. When the player returns to the family, the mother tells him that the dreams have ended. She rewards the player with a small amount of gold. ... and Im currently working on plans for the dark brotherhood and the imperial city. I didnt push that, it just happened. My question: are you even interested in that? That Vaermina quest is good stuff! Even if the reward is a bit high. You have some good ideas, but they are not moored enough in Imperial culture. This was one of the major problems with Oblivion (imho), that most of its quests could have happened anywhere on Tamriel, or even transposed to entirely different fantasy settings without too much trouble. Compare to Morrowind and (to a lesser degree) Skyrim, where there are lots of quests which reflect the bizarre and unusual cultures in which the games are situated. An example: in Cyrodiil, Daedra worship is perfectly legal. How would this impact these cults, quests, and the people in general? If a Nibenese was suffering from nightmares, the first thing he'd probably do would be visiting the local Vaernimite to make sense of it all. Also, a smaller point: Clavicus - at least, the Imperial Clavicus - would never ask someone to steal something for him. It goes against his nature. The Dark Brotherhood, Arcane University and Imperial City aren't our immediate priorities, I'm afraid. Right now we're focused on the Colovian west coast, with the cities of Stirk, Anvil, and Sutch: politically unstable trade cities with Nordic and Redguard influences. It will be quite a while before any of the eastern stuff gets touched - especially the Imperial City. The reason you can only post in this forum is because you haven't been accredited as a P:C modder yet. If you want to join the project you have to contribute a showcase: a finished interior cell, exterior landscape, quest or model/texture. A certain familiarity with Morrowind modding tools is a prerequisite, if only so you are aware of the capacities and limitations of the engine. If you've already made a showcase for TR, you can just post a link here. Hmm, okay, I think I understand what you mean. I would say the Clavicus Vile quest can be changed. Lets say instead of stealing the artifact the mercenary has to purchase it - but the noble doesnt want to sell the amulet. So the mercenary has to use his speechcraft and mercantile skills which are not really well trained. Instead of trying that himself (or after failing) he sends the player to talk to the noble and convince him to sell the amulet. This would fit into Clavicus Viles "trader" character even more than a theft. The Vaermina quest would maybe fit into another province. OR I can change it, but maybe it will lose a little of its dramaturgy. My favourite is the first option. And yes, now that I did so much for TR - and I have always advocated a unified tamriel in one mod (or its one of my secret dreams ) - its clear for me that I want to join project tamriel as well. One little thing: I have posted in my showcase over at TR interior cells, one with NPCs, but Im not yet promoted to developer there. There wasnt a review or any feedback and because in my showcase happened quite a few things other than interior design, I think it was just forgotten. But I will post the interiors here as well. Edit: my "julianos shrine" is furnished wrongly, i know. I did not know a few things when I made that interior. Edit2: Ahem, the names of the cells are "Imperial House" (showcaseinterior) and "AndothrenJulianosShrine"
Hey, NathanJ! I'm not a reviewer, but I checked your showcases and have some advice to share, if you please. But first, let me admit I was mostly checking your Imperial House and only later realised that other interior is way better and almost error-free, at least to my unskilled eye. So I suppose some of this stuff is obvious to you already, but oh well. Some of this stuff can apply to AndothrenJulianosShrine as well. I hope it doesn't sound discouraging, too - it's a splendid work on many levels. there are some things here I really like. Stuff like a plate resting on a table's leg, legionary's gear hanging on the wall or this staff leaning on monk's bed (in Hlaalu interior) prove you have an imaginative approach and you know what you're doing. Those are cool. this house lacks some details. House of this size should have twice as big reference count. For starters, try adding some windows it seems you forgot about them. How about a fireplace, too? Most common houses have a fireplace (or even two! check Eldafire's house in Seyda Neen, that uses the same interior shell; and while you are here, you can see about using in_lava_blacksquares in similar way), and this legionary's trophy would look great hanging above one. What else? Use furn_hook_01 statics to have the trophy hanging on them (currently these arms can be considered to be floaters); you might put furn_web00 in some untidy corners of this place; or maybe add a cellar down there? Again, many imperial houses have seem to have one. When adding some details, try considering how this particular resident would want his place to look like. As I gather, this person is supposed to be a former legionary, yup? Maybe he (or she) still holds the legion code dear and have a copy of Ordo Legionis book well-hidden somewhere in his house? Or maybe life wasn't easy on him and he became an addict? Check Cosades' house for inspiration, then. Or maybe this person has green fingers and cultivates some plants he or she gathered when serving his duty in foreign lands? Not every single interior needs a big twist or secret backstory, but this one is too basic right now. there is some style-mixing happening here. De_p furniture are supposed to be used solely in dark elf poor interiors, unless you've got a good, story-justified reason for violating this rule. You could replace de_p_closet_ with com_closet_, active_de_p_bed with active_com_bed and furn_de_tapestry with furn_com_tapestry (also, in regards to tapestries, please note you messed up their rotations; in this case they should be set to 180 degree on Z axis). Misc & light de_p items are probably fine, if there aren't too many of them. that's a thing a proper reviewer would be more proper to catch, and I probably missed some cases of this defect, so forgive me I won't even try to list them out. What I mean, there are quite a few floaters and bleeders in both your interiors, even this cool plate on the floor I mentioned up there doesn't touch table's leg properly and a pile of cutlery in Andothren shrine, despite being a brilliant concept, is the worst in this regards. Piles of ingredients are pain in a neck to make them look right, I know, but most of them have at least some well-noticeable issues. Make sure there are no bleeders, rotate it a little more, and make sure physic's laws are preserved and everything rests on what it should rest on, logically. There are many examples when your items' rotation or placement is perfect, so it's just a matter of showing more dedication on your side. We all here know how frustrating it can be sometimes. Feel free to harras me if you've got any more questions. I'll see if I can help. There are some fine tutorials on these boards and on TR's forums, that I still visit every once and then, so they can be helpful too. - GMST contamination: if you look at your plugins in the details section, you'll notice a couple of edits to GMST values. This is a well-known issue with Morrowind modding, that can be avoided by loading Bloodmoon.esm or Tribunal.esm alongside your file. You can find more information on GMST contamination here. - Dirty edits: sameways, looking at your shrine plugin in the details tab shows several dirty edits to dialogue. For the topic "Julianos", for example, you'll notice that besides your own dialogue all the vanilla INFO records have also been saved to the mod. This is also a very common issue with dialogue, especially when you are adding dialogue to existing topics. These superfluous edits can easily be removed with a tool like TESAME. The Construction Set is a less than ideal tool, so always be on the lookout for dirty edits - also outside of dialogue. 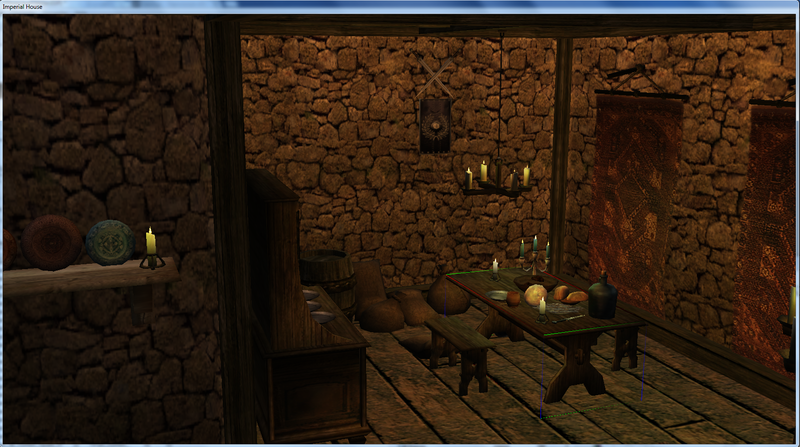 In general, you don't need to add NPCs or dialogue to an interior - this is done later. While you can add unique notes and books to your interior, it should be done sparingly (in line with vanilla interiors) and should only happen if it adds a strong extra dimension to a character or interior, or leads to a quest. Okay, great, thank you all for taking the time to review those interiors! While I was reading that.. Yes of course why have I forgot WINDOWS?? I didnt realize that my interiors were that bad I guess Well, lets say I love creating interiors but until Im really convinced that I have something thats meeting your/our standards (or tries to), I wont upload any. Concerning you and us, I think in the new year there will come many quests and questlines plus dialogues from me, I have already begun with plans and sketches for the pretty empty quest-landscape of TR. Thats my main occupation right now. I will post them over at TR when their discussion about the (possibility of a) new website and claim system has ended. IF you are interested in my lore-works and new quests, which are at least better than my interiors (*cough*, *cough*), I can post some here too, the ones which are probably functioning smoother in Cyrodiil . Sorry it's been rather quiet lately. I think everyone is busy with other projects and IRL stuff. Anyway, I've accredited you as P:C Modder, so you should normally be able to access the project interior and post your work in the appropriate places.